From in-person discussions, q&a sessions in CreativeLive classes I’ve been involved in, and from online discussion groups I have come to the conclusion that shutter speed when using flash is a difficult concept for photographers to grasp when first introduced. We’re all familiar with the three legs of the exposure triangle: ISO (sensitivity), Aperture (amount of light passing through the lens), and Shutter Speed (how long the light is allowed to reach the sensor. For a more in depth look at how shutter speed affects your photos please visit this guide on the PhotographyTalk site). When we add flash into the situation there are another two legs added, the amount of light and the duration of the flash. And at the same time, the Shutter Speed leg’s effect is somewhat tossed away. This makes it sound more complicated than it actually is. I find that it helps to think of flash photography as making a double exposure with one click of the shutter button. We have an exposure for the existing ambient light that is controlled by the big three (ISO, f/stop, shutter speed). And we have a second simultaneous exposure for the flash that is controlled by ISO, f/stop, and flash power. As ISO and f/stop affect both exposures we can eliminate them from the exposure equation. That leaves us with shutter speed to control the ambient light and flash power to control the flash light. More about that when I talk about working with flash outdoors in sunlight. Let’s start with studio lighting. In the studio we have control over the ambient light situation. We can make the studio completely dark so that even a full 1-second shutter speed at a typical aperture of f/8 or f/11 will not record anything on the sensor. Then we add the flash. The flash provides the powerful light that does record on the sensor. But it only records for that split second that the flash is firing (the flash duration). So out of that 1-second the shutter is opened, the flash is only firing for a fraction of the time. Maybe 1/300 of a second for a big old powerful studio power pack and head system or only 1/9000 of a second for a newer flash unit. The flash duration has effectively replaced the shutter speed in terms of both providing the light for the exposure and for providing the speed necessary to stop motion. Now I am not advocating a shutter speed of 1/30, just using that as an example. Go ahead and test this yourself. Set the ISO and aperture you would be using in the studio (ISO 100 and f/8 is a good starting point) and turn down the ambient light to have a darkened studio. Before connecting and turning on your flash take a photo with those settings to see what gets recorded. In many cases the frame will be black, or show just a faint image. If you see too much image raise your shutter speed to 1/60 and try again. So, what happens if you do set your shutter speed too high? You will notice a dark band along one edge of your photo or no image at all. Here is a set of test images I created with the Canon EOS 6D Mark II and studio strobes (two Interfit Honey Badger flashes, one on the subject and the other on the background). 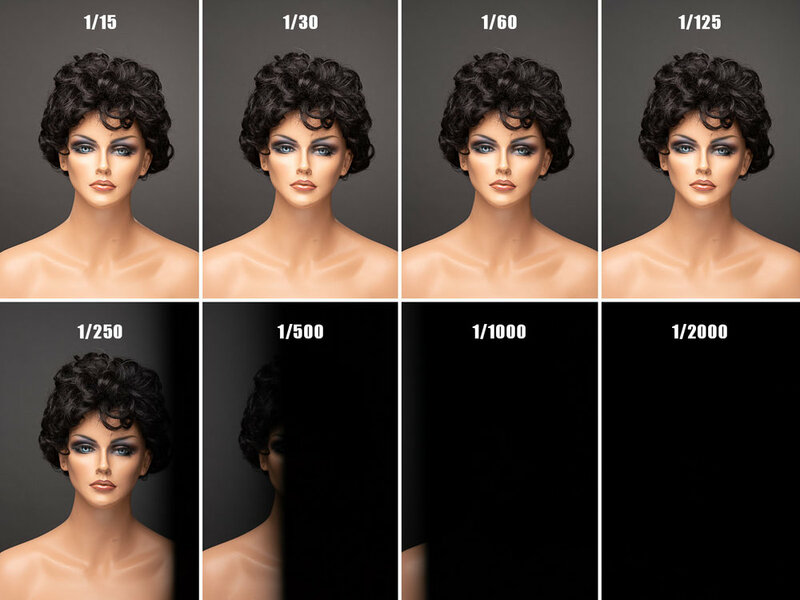 The shutter speed for each photo is shown above the mannequin head. You can clearly see that the flash synced at speeds up to 1/125, but at 1/250 there is the start of a black band along one edge and at 1/2000 the frame is completely black. With some lower cost remote flash triggers you would even see the black band at 1/125, so you would need to set your shutter speed to 1/80 sec. or 1/60. If you have had that black band along the edge of some of your flash photos, here is the explanation. For some time now dedicated camera flashes (I will refer to them as speed lights here) have offered a feature called High Speed Sync (HSS). This feature is now becoming available in studio flash units like the Interfit S1. It allows the flash unit to synchronize with faster shutter speeds. This comes in most handy when working outdoors in daylight and you want to make photos at wider apertures such as f/2.8 or wider and want to provide some fill light from the flash or even use the flash as your main light source. The issue there is that a typical mid-day exposure at ISO 100 and f/2.8 might call for a shutter speed of 1/2000. As we saw above, the flash won’t have any effect on the image at 1/2000 sec. On the left there is too much available light to be able to work at f/1.8, everything is overexposed. On the right HSS has been enabled and the shutter speed set to 1/8000 sec. to take the background ambient exposure way down and have the Interfit S1 battery-powered flash provide the main exposure on the subject. Here the S1 is being modified by a 2x3-foot softbox. Thanks for following along! I cover all this and more in my book Anatomy of a Studio Portrait. I also teach lighting classes in the Seattle area at Glazer's Camera and at Photo Center Northwest. Private instruction is also available. Now please go out and light up the world!